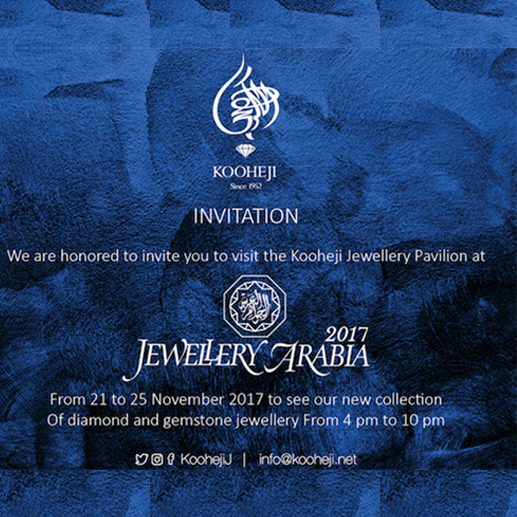 As part of its continuous pursuit of all economic activities in the Kingdom, Kooheji Jewellery is participating in the 2017 Jewellery Arabia Exhibition, one of the largest exhibitions in Bahrain serving the economic sector in general and the Jewellery sector in particular. The 26th Jewellery Arabia Exhibition will be held under the patronage of His Royal Highness Prince Khalifa bin Salman Al Khalifa, Prime Minister of the Kingdom of Bahrain, at the Bahrain International Exhibition and Convention Centre from 21-25 November 2017. The exhibition is expected to attract thousands of visitors and buyers from Bahrain and other countries. "We look forward to welcoming visitors and guests to our pavilion at galleries 1 and 2 of the Jewellery Arabia Exhibition," said Waleed Al Kooheji, Chairman of Kooheji Jewellery, adding: "This year we will unveil the newest and latest collections of fine jewellery, which we are sure will surprise our visitors and customers with the purity of the pieces and the accuracy of design and high quality.